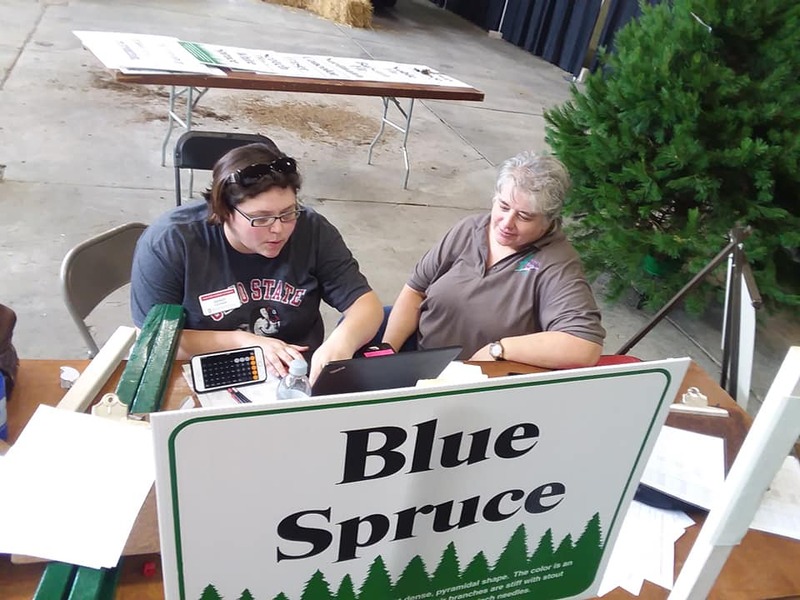 Earlier this week, a team from OSU Extension judged Christmas trees at the 2018 Ohio State Fair. All the trees were grown in Ohio. Trees were judged on their shape, fullness, color and overall appearance. Trees needed to be between 6 and 8 feet tall, have a handle between 6 and 12 inches long, and have a correct range of taper based on the species. The three categories included: spruce, pine and fir. The trees will be on display at the Ohio Christmas Tree Association booth for the duration of the Ohio State Fair. During the state fair, attendees will have the chance to vote for the People’s Choice Award. This award will be announced at the conclusion of the fair. Fair goers will also have a photo opt like these young volunteers. Greig Christmas Tree Farm in Lake County not only walked away with the honor of exhibiting the Grand Champion Christmas Tree at the Ohio State Fair, but they also exhibited the Reserve Champion Christmas Tree. This year’s winning tree was a Canaan Fir and the Reserve Champion was a Blue Spruce. Brothers Jeff and Doug Greig and mother Betty Jean will have the opportunity to represent Ohio in the 2018 National Christmas Tree competition. The trees in the competition were selected from trees submitted by growers from across the state of Ohio. They were also judged by a panel of judges consisting from The Ohio State University faculty. The primary factors considered in the judging included shape, fullness, color and overall appearance. If you would like any further information on the OCTA or their activities, reach out to the OCTA Office at 740-828-3331.